We see their designs almost every day, most of the time without realizing it. When we open our laptop and Windows 8 boots up, when we watch Stephen Spielberg’s blockbuster “Jurassic Park”, when we check our balance at a City Bank ATM, or when we download the Rolling Stones album “Bridges to Babylon” on iTunes. These designs and brand identities, along with many others, were created by five creatives who influenced the world of graphic design like few others over the past decades. They all live and work in New York, and accepted an invitation by OOOM to meet for a two hour talk, uniting all of them in one room for the first time. We see their designs almost every day, most of the time without realizing it. When we open our laptops and Windows 8 boots up, when we watch Steven Spielberg’s blockbuster “Jurassic Park,” when we check our balances at a City Bank ATM, or when we download the Rolling Stones album “Bridges to Babylon” on iTunes. These designs and brand identities, along with many others, were created by five creatives who have influenced the world of graphic design like few others over the past decades. They all live and work in New York, and accepted an invitation by OOOM to meet for a two-hour talk, uniting all of them in one room for the first time. Milton Glaser is considered the most important designer of the past decades. He designed the legendary “I Love NY” logo with the red heart that now graces millions of T-shirts, books, mugs and merchandizing articles. Glaser founded New York magazine, and his work for Bob Dylan, Stevie Wonder and Olivetti is legendary. President Obama awarded the designer the “National Medal of Arts” in 2009. Stefan Sagmeister, who helms the design agency Sagmeister & Walsh, is one of the most innovative designers in the field. His clients include Time Warner, the Guggenheim Museum, David Byrne and the Rolling Stones. The Austrian-born designer’s exhibition “Happy Show” and his movie “Happy Film” has been seen by hundreds of thousands in museums and movie theaters all over the world. Paula Scher designed 1500 record sleeves as art director for CBS, from Bruce Springsteen and Leonard Bernstein to Billy Joel, providing visuals to the music of an entire generation. She created the Citi logo–which is still widely in use, from Citibank to Citibikes–on a napkin. Her other notable designs include the Windows 8 and Metropolitan Opera logos, and her clients range from the Museum of Modern Art and Coca-Cola to Bloomberg. Paula Scher’s work is exhibited in museums across the globe, including the Museum of Modern Art and Centre Pompidou in Paris. Chip Kidd is the world’s most important designer of book sleeves. To date, he has created more than 1000 covers, including several designs for Haruki Murakami, Michael Crichton and Bill Clinton, and many for books that went on to become worldwide bestsellers. His “Jurassic Park” logo, originally created as a book cover, went on to become a branding icon used in Steven Spielberg’s film version of the novel and millions of merchandising articles. Jan Wilker’s agency, karlssonwilker, counts Puma, Nike, The New York Times, MTV, Mini and Adobe among his clients. After creating covers for TIME magazine, Wilker also designed the cover of OOOM issue 05/2017. 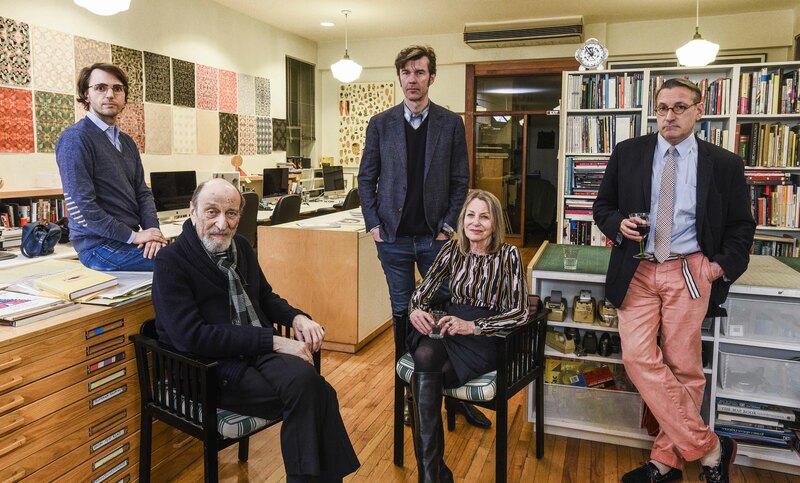 We are sitting in Milton Glaser Studio, a legendary location in the history of graphic design. He will tell us more about this soon. In 1968, you founded New York Magazine here, for which you also were Editor-in-Chief until 1977. The magazine still has a readership of 2.8 million. Glaser: We bought the house in 1965. At one point, I was just mentioning–there was once a hundred people in this building, which is inconceivable now as we sit here. But eventually New York Magazine had to move, the studio separated, and the building went on to become a studio building for a studio that I started in 1974. There were no computers back then; we had to do all our work manually. Today we have design students working on the ground floor. Kidd: Milton–you would never remember, but I walked into this building first in the fall of 1986, that was when I was 22, for an interview. And you were very kind to me but you didn’t hire me. But it was just a huge thrill! Stefan, when you entered the building, you saw some of your students or people that you know?! SS: I think there is a whole bunch of our students here! Almost all of us here teach at the School of Visual Arts. Some of my favorite students, and I am sure some of your favorite students too, have started a little design studio right at the entrance at the ground floor. And it looked super cozy and like one of those studios that I am very proud of; it is always pleasing to see good work coming out of people that you knew. I think every teacher feels that way. When you talk about good work, the question, of course, is: What is good design? Scher: I change my opinion about that all the time. I think good design depends upon what level you are talking about. About professionalism? Are you talking about even standards or about work that is really very surprising? Work that is surprising often defies the term “good,” because it may make you upset when you see it. Or you might think it’s absolutely outrageous. Or you might not notice or understand it. I find that more interesting than basic, good design, which may be well crafted at times, but is often not more than that. CK: What is good design? I can currently tell you what really bad design is. And that is a cable-TV remote, which I have been having to deal with for a while now. It is just a horribly designed, confusing thing that has ten zillion buttons on it that don’t apply to what you are actually trying to do. Would you say that Apple, with its alternative concept of reduction to the essentials, employs good design? CK: Yes, I use Apple Pay (a payment system for mobile apple devices) all the time now. It works for me. But you know, there is good formal design, there is good technical design. Wilker: Good design is never lazy. And not lazy in a way that it is either crafted meticulously or the thinking was not lazy. That it was daring. Laziness breeds bad design, that’s what I would say. That’s where I would make the distinction. But Paula, you are shaking your head? Scher: I have a lower expectation of good. Sagmeister: There is way to look at it from our point of view, and there is a way of what it does to the viewer or the people who use it. I would say good design is anything that helps or delights somebody. In very few occasions we might be able to do both. If it does neither, maybe it was a waste of time. Glaser: You have to separate design from its intentions. At a certain point, one has to ask: What is my purpose here? We know that one’s purpose is not only for oneself. Which is actually true for every other aspect of your life as well. We learned it and we begin to believe it after we experience the disasters that human kind can produce. Particularly in this moment in our history, with men like Trump, who is entirely self-serving and has absolutely no concept of the other. You have to have a concept of the other for any civilization to survive; and so a question that designers rarely ask themselves, although it should be the starting point for everything we do, is: What are the consequences of my work? Or: Am I causing harm?